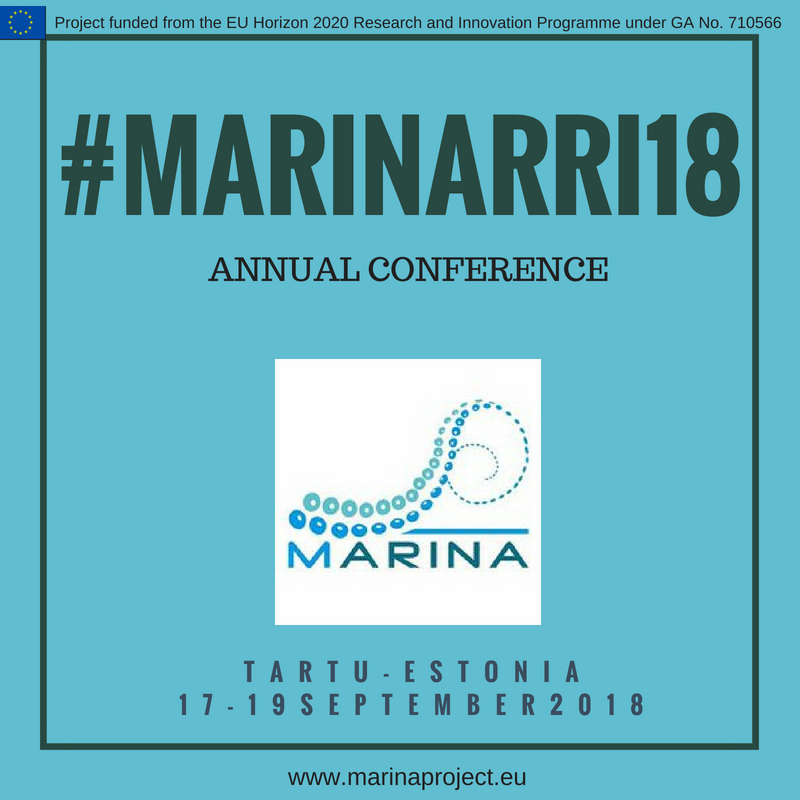 Now open the call for papers for the MARINA Annual Conference, titled "Marine Responsible Research and Innovation in Science, Innovation and Society", to be held in Tartu, Estonia, 17 September 2018, hosted by the Science Centre AHHAA. The deadline for paper submission: 20 of July. The second annual conference of the MARINA project aims at presenting cases studies highlighting examples where the implementation of RRI dimensions, principles and topics, made a difference in the impact of the research and innovation in the context of the H2020 societal challenges. The concept of Responsible Research and Innovation is relatively recent and it is part of the Europe 2020 strategy. Its vision is to promote a stronger collaboration among scientists from different disciplines, societal actors, citizens and policymakers in order to achieve a wider dimension of science and innovation and enhance the role of society in dealing with its challenges. With this focus, the conference will cover and systematize case studies and experiences developed in several past and running research activities and projects on RRI on within another context in relation to marine issues. This portfolio of experiences will also include examples of guidelines, approaches and good practices dealing with different aspects of RRI and marine challenges. These themes will help fill the gap in the present literature. The conference overall aim is to establish, organise and activate an RRI community on the marine challenges, which involves scientists and societal actors working together during the whole research and innovation process. with the common goals of aligning both the process and its outcomes with the values, needs and expectations of the society and integrating citizens visions, needs and desires into science and innovation. The submitted papers are encouraged to discuss the specific theme(s) of marine challenges in the perspective of: Governance, Public engagement and Inclusion in the RRI process; Science education and communication in RRI actions; Gender and Ethical issues in RRI initiatives; Sustainability of RRI processes. Find all details on the #MARINARRI2018 Conference and Call for Papers on the 2018 MARINA Conference website. See also: Call for papers "Towards RRI Practices and Policies": open till 20 July! ← MARINA International Workshops on Responsible Research & Innovation taking place across Europe: have your say and engage!